Hawthorn is a suburb in Melbourne, Victoria, Australia, 6 kilometres (3.7 mi) east from Melbourne’s central business district. Its Local Government Area is the City of Boroondara and Hawthorn has some jaw droppingly beautiful houses and streets. The extension of the railway from Burnley to Hawthorn, first in 1861 and then in 1882, accelerated residential subdivision and the growth of a commuter middle class. 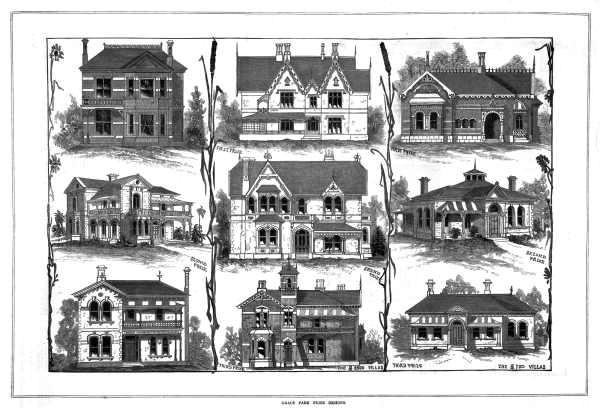 Hawthorn expanded rapidly during the 1880s land boom when grand Victorian houses built in subdivisions like the Grace Park Estate spoke of a well-to-do suburb. Grace Park Estate was part of the large land holding of Melbourne hotelier and leading Hawthorn pioneer, Michael Lynch and his wife Julia (nee Grace) and one of the first estates in Hawthorn. Chrystobel Crescent is thought to follow the original curving drive to the Lynch family home, which had become Grace Park Ladies College by the time lots in the estate were offered for sale. Remaining blocks were sold after 1906 when the Kew railway line cut through and most homes in the estate were built after that time. Today the estate is recognized as having some of Melbourne’s best Edwardian architecture. Houses from the Edwardian era were built in line with expanding tram and rail routes and can be found in leafy inner and middle ring suburbs such as Middle Park, Armadale, Hawthorn, Camberwell and Ascot Vale. Particularly sought-after Edwardian properties are found in Malvern’s Gascoigne Estate, Hawthorn’s Grace Park Estate and Camberwell’s Tara Estate. Either brick or weatherboard, such properties often have complex terracotta tiled roofs, wooden verandahs, stained glass window panels, and ornate plaster cornices and ceiling roses. Expect to spend $2 million to $2.5 million for an unrenovated property in Grace Park, with renovated properties starting at $3.5 million. In other less well preserved areas of Kew and Hawthorn, Edwardian properties can be snared for between $1 million and $2 million. “Yarrock” (c1895), a handsome mansion set in sizeable gardens (1,256 sq. m) in one of Melbourne’s most revered pockets, the prestigious Grace Park Estate. This is built in the style of Federation filigree. Located on a corner in a tightly held area of Hawthorn with easy access to the Yarra River plus Victoria Gardens, Kew Junction, Glenferrie or Bridge Road shops and restaurants, transport options and prestige schools, this beautiful Federation residence combines heritage appeal with renovations that have preserved its character and period attributes. Born in the 1920’s, “Lurnea” has a wealth of period personality and a beautiful deep, north-facing rear garden. Lovely leadlights, rich timber floors and paneling and handsome timber lined ceilings are evocative of classic gentleman’s Edwardian design. Timber panelling and leadlight windows. Located in a quiet cul-de-sac ending in a reserve in a prized pocket of Hawthorn, this elevated timber home c1910 shows how not to renovate a Federation design with a two-storey contemporary extension added to the rear of the traditional front rooms. Havelock House is a distinguished c1900 Edwardian residence situated on 1342sqm of beautiful gardens. High pressed metal ceilings, leadlight windows and Baltic pine floors convey superb period elegance through the impressive reception hall with fireplace. The former ballroom is divided into two stunning sitting rooms with marble fireplaces book-ending the formal dining in the middle. “Karinya”, a charming light filled Victorian nestled into a sleepy cul-de-sac and yet only metres to Hawthorn train, Burwood Rd tram, St James Park and the Yarra banks. A unique and historic Queen Anne style mansion (also described as Romanesque revival) surrounded by sprawling lavish gardens of approx 3000sqm. in arguably Melbourne’s most prestigious location. Built in 1872 and designed by architect James T Conlan, Yarroma has high archways, large porticos and formal living spaces. This St James Park Estate heritage listed waterfront home features six-bedrooms, four-bathrooms, heated in-ground pool, tennis court, expansive Italianate gardens which also includes a conservatory. This iconic Victorian family home (1888), is located in the heart of the St James Park Estate. It speaks of the romance and history of the Gold Rush development, and is located on a beautiful, established, northern garden allotment of approx 1,648m2 with separate 3 roomed garden cottage.